Next Act Theatre presents "Outside Mullingar"
“The middle. The middle is the best part. 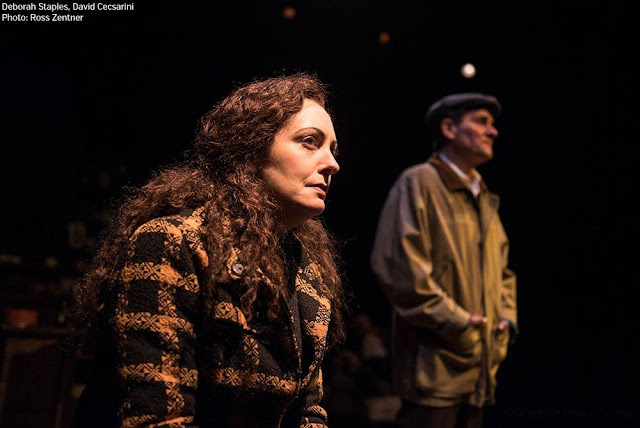 The middle of everything is always the heart of the thing.” While John Patrick Shanley’s Irish-romance-meets-family-dramedy deals with its share of beginnings and endings, Outside Mullingar is a play that finds its two main characters planted in the middle. Anthony and Rosemary are middle-aged and at the crossroads of their separate life paths. The question is: Will those paths converge? The two grew up side by side on neighboring farms in Ireland with their families’ combined history ever tied to the land—particularly a stretch of farm that should belong to Anthony but, due to a silly childhood tantrum, now belongs to Rosemary. The two bicker plenty, fight against their romantic inclinations, and have different ideas of what makes life worth living. Yet under it all, they care deeply. This will-they-won’t-they play is especially fun to watch thanks to the husband and wife team of David Cecsarini as Anthony and Deborah Staples as Rosemary. Staples is fiery and self-assured, beautifully rendering Shanley’s poetic phrasing and moods with masterful grace. Cecsarini maintains a sympathetic sort of mystery until his character’s final charming curveball, revealed near the end of Act Two. It was a challenge, Cescarini said during a post-show talk back, to depict Anthony as a man caught under his father’s thumb, while keeping him from being too dark and brooding. James Pickering plays the aforementioned father’s thumb, Tony. 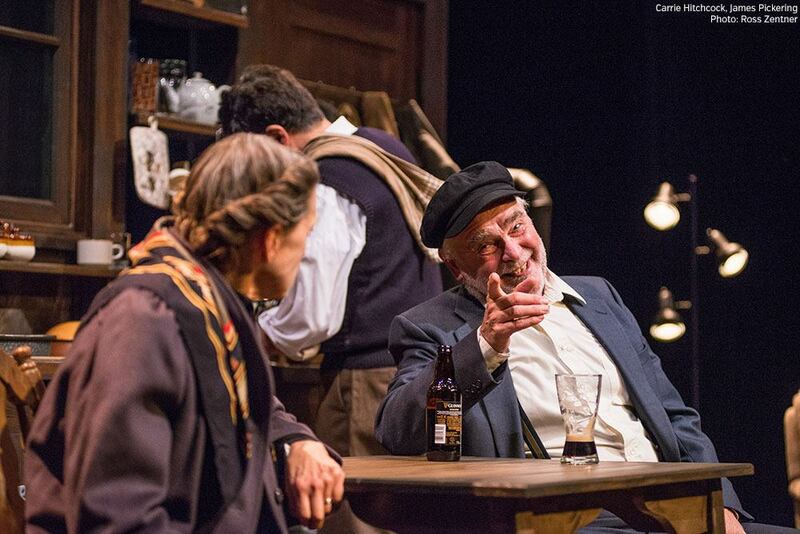 Pickering has a knack for portraying believable stodgy old coots that both mangle and melt hearts. Tony is an amalgam of motivations from family pride to legacy to the want of an eleventh-hour amends with his son. Pickering’s final on-stage moments make the heart simultaneously ache and sigh; it’s a lovely moment to behold. Tony’s elderly counterpart is Rosemary’s mother, Aoife—a woman who has just lost her husband and is grappling with grief. Carrie Hitchcock is ever a chameleon, blending seamlessly into the roles she takes on, and Aoife is no exception. She draws laughter and the occasional welled-up tear in a memorable, moving performance that highlights the marvelous breadth and depth of Hitchcock’s craft. "Nothing's as amazing as a musical, with song and dance and sweet romance, and happy endings happening by happenstance." 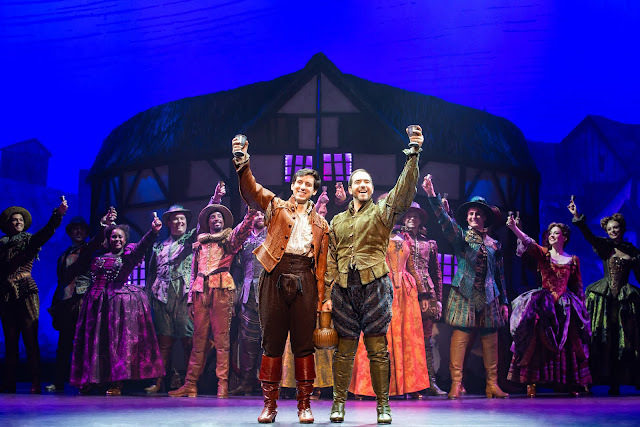 For musical theater lovers, Something Rotten is, at its heart, an ode to musical theater — and the show wears its heart on its sleeve. Speaking of hearts on sleeves: Shakespeare. The heart of Something Rotten also beats madly for Shakespeare. Set in 1595, this is the story of Nick and Nigel Bottom, two brothers who are desperate to write the next hit play. In an attempt to top everyone's favorite rockstar Bard, Shakespeare, Nick asks a local soothsayer what will be the next big thing in theater. The fortune teller peers into the future and sees bright lights, catchy tunes, feathered chorus girls, dance breaks, kick lines, and simultaneous singing and acting. That's right — musicals are the next big thing. From there, the references to musical theater abound. Everything from Sound of Music to Cats to Fiddler to Les Mis gets a momentary riff. The tone overall is cute and kitschy; the kind of light, frothy, un-challenging spectacle one would expect from a show with such musical numbers as "God, I Hate Shakespeare" and "Hard to Be the Bard." Where the challenge lies, for fans of both musical and Shakespearean theater, is trying to catch as many of the references as you can. While some theatergoers may crave a little more meat and genuine feeling from their musicals, it's important to remember that's not what Something Rotten is aiming for. It's meant to be a delightful, dazzling escape filled with corseted girls in golden tap shoes, The Bard on air guitar, and a big ol' wink to the audience before launching knowingly into any musical encore. 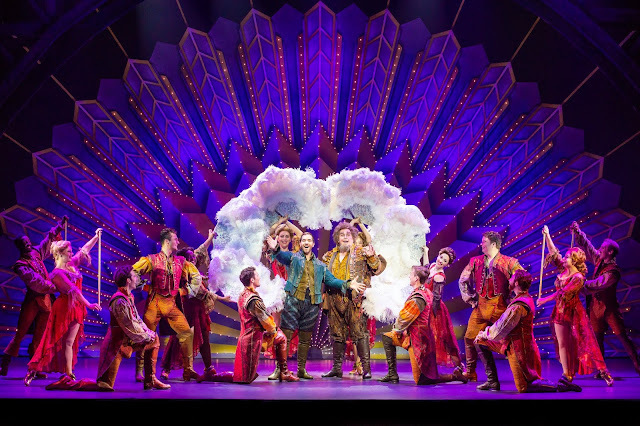 If serious theater is your only joy, then you will find little of it here; playfulness and jokes made of delicious low-hanging fruit rule in Something Rotten. Of the cast bringing this show to Milwaukee, Matthew Michael Janisse and Richard Spitaletta as brothers Nick and Nigel Bottom, respectively, do their parts ample justice. Spitaletta is especially endearing, and he's perfectly matched by his love interest, Portia, played by Jennifer Elizabeth Smith. She's adorably sweet with a hilarious innocence ever-laced with sexual undertones. Nigel and Portia's duet, "I Love the Way," ranks among my personal favorites. 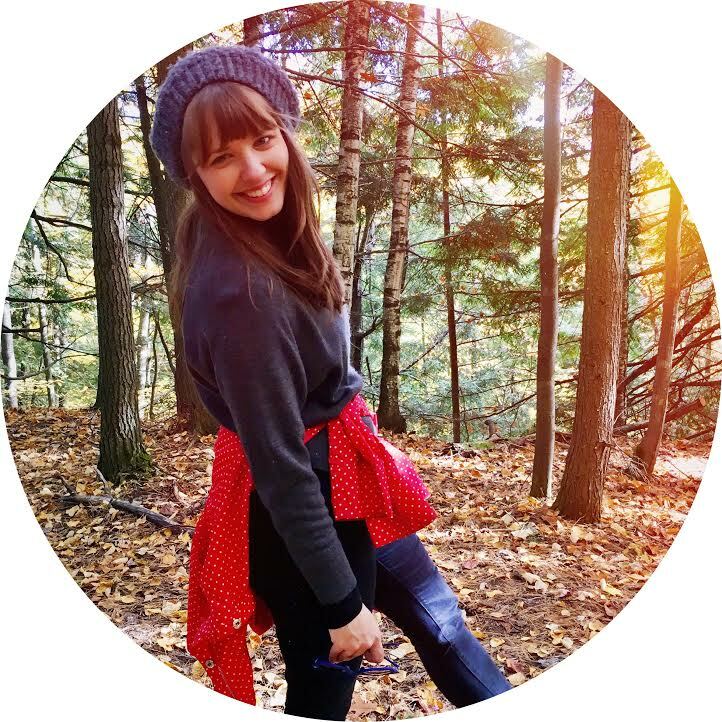 Nick's wife, Bea, is played by Emily Kristen Morris — another funny lady with a full and lovely voice to boot. Truly all of the cast nailed the wonderful choreography and seemed to nail the singing — I just wish we could have heard some of it more clearly. This lack of clarity is not an uncommon sentiment, per my own experiences at the Marcus Center and those patrons grumbling around me at intermission. Often times, the audio simply isn't clear, the music overshadows the voices, and it's hard to make out what the actors are sing-saying. It's a shame really, because the experience of seeing a show at the Marcus certainly colors the experience of the show overall. 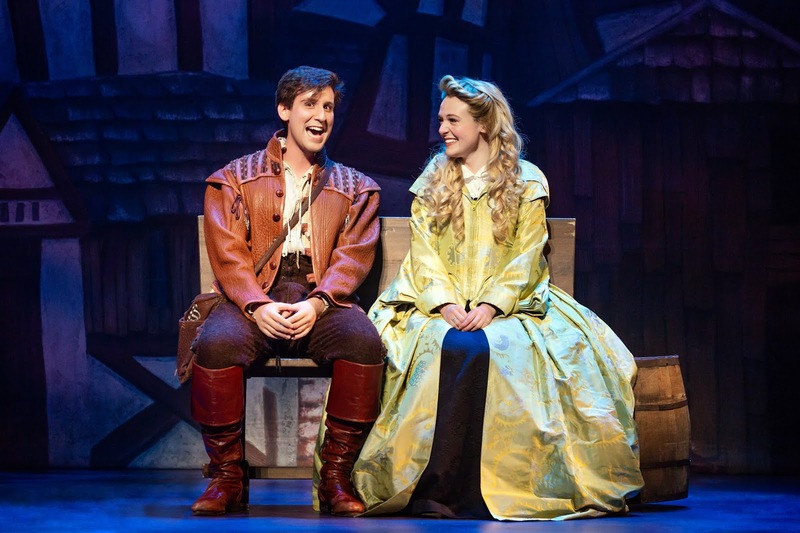 And it's not just this one time — Something Rotten is only the latest to suffer a little from the acoustics they've been dealt here in Milwaukee. How to combat this? Short of suggesting a new theater venue (wouldn't it be loverly?! ), I'd advise listening to any musical before seeing it at the Marcus Center. That's something I didn't do for Something Rotten, but rather wish I had. Jill Anna Ponasik of the Milwaukee Opera Theatre (MOT) says two things converged to pave the way for Antiology: “First, composer John Glover and librettist Kelley Rourke expressed interest in creating a piece that would explore the issue of catastrophic data loss. Then, while trying to figure out how to help them do that, I asked baritone Andrew Wilkowse what was missing from his life.” It’s a question Ponasik often tosses out when the MOT begins a new commission. “A hootenanny,” Andy answered. Ponasik took the next logical steps and started preparations to commission a hootenanny about catastrophic data loss. A lightbulb moment sprung from Dana Spiotta’s novel Eat the Document, which grapples with information storage, personal identity, and the shift from analog to digital. This was the book the creative team wanted to dig into; Ponasik helped them do just that. This mix of hair-brained schemes and insane creativity are what make the Milwaukee Opera Theatre such a gem in the Milwaukee performing arts community. Leave it to Ponasik and her band of visionaries to host the seeds of a new opera at an east side bookstore, backed by a jubilant jumble of instruments — which will round out the hootenanny portion of the evening, no doubt. In the slew of vibrant, singular experiences that the MOT has put forth in recent years, Antiology is shaping up to join the ranks of greatness. So bring an open ear, a festive spirit, and maybe even your finger cymbals to Boswell Books this week for the kind of frolicsome good time that only the Milwaukee Opera Theatre can create. Lights flood the scene and the curtain is flung aloft as the ensemble bends and stretches, turning the Cabot stage into a pre-show rehearsal hall. Even before the music starts, we're shown this is a break-the-fourth-wall kind of production; a play within a play. 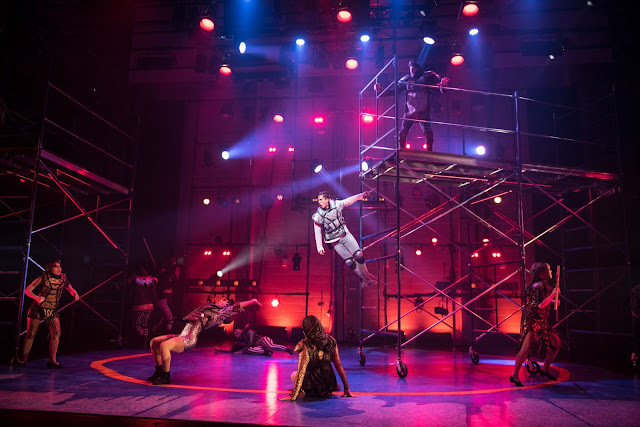 In Pippin's opening number, the Leading Player — a literal ring leader — invites us to join her acting troupe for an hour or two and gives us a preview of the plot about to unfold: Intrigue, humor, romance, illusion, battles, and lots of "magic to do." To sum up, Pippin tells the story of a young prince in search of a meaningful life. Upon leaving university, he searches for that meaning by dabbling in war, lust, and common work, always believing himself to be extraordinary, and therefore destined for something more fulfilling than these empty pursuits. This search for significance makes for a story that holds up across the decades. Pippinis a child of the 70s, having brought home five Tony awards in 1973. A sort of flower-power influence is felt throughout the show, in certain tones and melodies. Yet the themes are timeless and relatable, with the score ever a mix of foot-tapping and heart-lifting. What the Skylight brings to Stephen Schwartz's already glorious music and lyrics is a cast and creative team brimming with sheer brilliance. As the titular Pippin, Lucas Pastrana shines. More than stirring vocals both sweet and soaring, he also boasts the acting chops, lending a youthful sense of wonder to the soul-searching Pippin. Commanding the stage from show-stoppers to tender ballads, Pastrana indeed finds his "corner of the sky" — and that corner is one of rising star and certified leading man. Krystal Drake's Leading Player pairs perfectly with Pastrana's Pippin. Drake delivers insanely controlled, powerful vocals from the get-go, and her commitment to precision is an asset throughout the show. She gives a undeniably fierce performance, as does the entire ensemble. Many others in the cast take their turn having a moment in the spotlight. Standouts include the hilarious Todd Denning as Pippin's father, Elaine Parsons Herro as the tap-dancing, lots-of-laughs granny, Kathryn Hausman as the sultry, conniving stepmother, and Natalie Ford as Pippin's love interest, Catherine, her voice sweet and pure as can be. This cast of characters moves together in marvelous choreography by Christal Wagner. The dancing is simply some of the best to grace the the Cabot Theater in recent memory. While the dances and movements are entrancing on the whole, contortionist Ayana Strutz deserves a special mention: she's so crazy-good, it's hard to take your eyes off her. Scenic Designer Keith Pitts and Lighting Designer Jason Fassl use their talent to round out the splendor on display, as the play between simple sets, light, and shadow add an awe-inspiring depth to the show. Scenes featuring human shadow puppetry are especially remarkable. In the end, Pippin calls into question the pursuit of glory and "one perfect act." It's the idea of owning one shining, dramatic moment, rather than compromising and settling for what might be considered commonplace. Though Pippin's hopeful message rings clear, this Skylight production compromises on nothing. From cast to choreography to set design, it couldn't be further from commonplace. Pippin is magic through and through — a near-perfect act indeed.